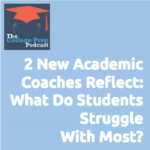 Academic coaches get an intimate view into family life and student struggles. In this episode, Gretchen interviews two recent graduates from her training program about what surprised them most, and gleaned some great tips for families about how to be more proactive. Find out more about Jessica at www.DIYHomework.com and Nancy at www.bayareaacademiccoaching.com. For more information about Gretchen’s Launch Your Biz coach training, visit this information page. For more information about the Study Cycle, check out this free course for educators (and it’s great for parents as well).